Folk International in Gulshan is a heaven for Christmas shoppers. With Christmas-themed songs and jingles playing on the stereo, this store gives you the very feel of the festive season. We live in a green Bangladesh but conifers traditionally used as Christmas trees are not one of the greens that you come by here. Folk International has a solution, albeit an artificial one, for that problem. You will find around 6 to 7 foot tall PVC Christmas trees to take home and decorate. The bright side is that you can wrap these up and save them for years to come and you will not be cutting down sources of oxygen. Nothing says that Christmas is being celebrated at your place better than a wreath hanging on your front door. These wreaths are not made of leaves and are re-useable; bright and colourful with twinkling fairy lights wrapped around the frame and a huge star embedded within, these blinking delights are a welcome sight after the sun goes down. 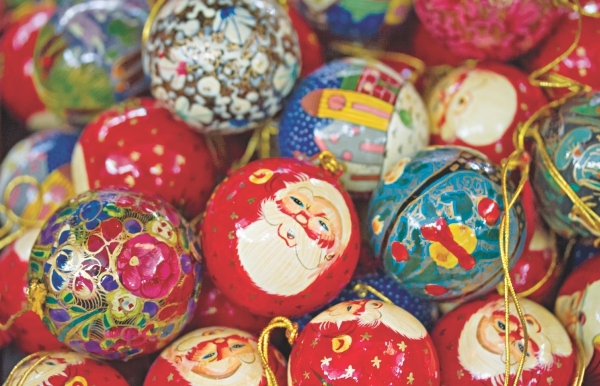 These are perfect Christmas gifts for children staying true to the festive season. The stuffed Christmas trees are beautiful and available in a variety of colours and combinations; one in a combination of navy blue and silver, the other in red, green and golden, while another comes in polka dots, with a star on top of each. These cost around Tk.800 and will definitely put a smile on the little faces. 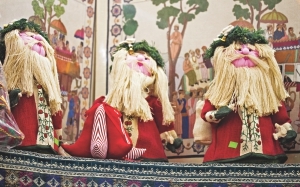 Then there are the cuddly Santas in red robes and jute beards wearing what seems to be a green hat much like that of an elf's. You want everything to be Christmas-themed on the 25th? You got it. Red or white tablecloths, runners, napkins, place mats, you name it. 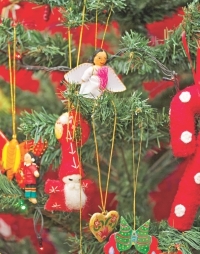 All of these are embroidered with Christmas-themed images such as candles, Mistletoes, angels and Christmas trees. To go with these you will find wooden napkin rings in red with pictures of Santa intricately painted on each of them. No, you cannot wear these. These socks carry a little of both the traditions of Christmas and the heritage of our country. You will find big jute socks to hang on your wall as we do not have fireplaces here. Some of these also have pictures embroidered on them. If jute is not your thing you will find versions of these in checked and striped prints as well. Candles carved beautifully in the shape of a fat Santa with his red suit, white beard and red cap and Christmas trees with colourful tree hangings carved onto it will be perfect to set the ambience on the dinner table or a side table. 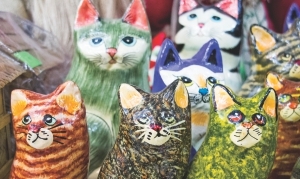 Other than that you may decide to pick up candle stands in the colours of Christmas or other brightly-coloured ones such as in a shape one reminiscent of the Cheshire Cat. Fear not; we are not suggesting taking home angels that will actually fly around in your home because life is not a fairytale and even if snowmen could fly they would melt in Bangladesh and again real Christmas trees are not native to our motherland. Fabric wind-chimes in red, white and green with a long string of angels and trees and snowmen standing in hoops will look nice hanging from the window or the door. 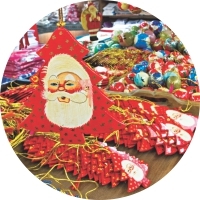 There are Christmas tree ornaments packed neatly into boxes of one to be given out as gifts as well as loose ones in a humongous array of shapes, sizes and kinds that will leave you spoilt for choice. There are angels, stars, balls and many others to select from. 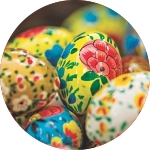 You might even want to bring a little feel from Easter if you are fans of brilliantly decorated eggs which can serve well as showpieces on the dinner table as well. 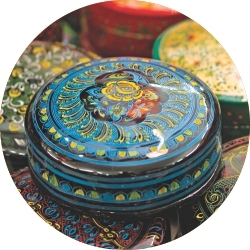 Tiny circular boxes for keeping jewellery or candies on the table with Santa's face painted on may be perfect for giving out as tiny tokens or using at home. Contact Folk International: House #19, Road #108, Gulshan; #988 0784, 0171 803 6666. Tucked away in a place you would least expect to come across, this store is housed on the road adjacent to the Holy Cross College and sells Christmas goodies that you can get your hands on. This thing will definitely bring a smile on children's faces and also set the mood for Christmas Eve when you are in your pajamas and enjoying a steaming cup of hot chocolate with your family -- the Santa Hat! The red Santa hats have Feliz Navidad sewn onto them which is basically Merry Christmas in Spanish. Wind chimes in golden, red and blue, wall hangings and Christmas tree ornaments, fabric door hangings with tinkling bells attached to ribbons, you name, it you got it! You may also choose to hang some of the smaller ones on the cribs of infants if you have a bundle of joy at home. If not, it's a great gift for someone who recently had a baby. Christmas is the birthday of Jesus and as history says he was born in a barn. Why not take home or gift a near and dear one a reminder of that very setting? At Jagorani you will find a set of figures from the nativity scene. The figures are intricately carved and are a perfect way to teach children about Christmas as well. Christmas is all about sharing the love among others and what is Christmas without presents on Christmas morning? You can give your acquaintances a gift-box from Jagorani which summarises all things Christmas. These beautiful boxes contain a big golden, glittery snowflake-shaped candle, three similar stars, half a dozen miniature drums and a half a dozen tiny golden bells. While another one contains a bell, replica of a pine cone and a pair of golden balls. Everyone has some dear one or the other living far away; why not go a little traditional this year and send them some heartfelt greetings in your own words instead of an e-card. It is more personalised and can be kept on the mantle and cherished. Grab your favourite from a bunch of different Christmas cards, all hand-made, available at Jagorani and pour your heart out. Jagorani is situated opposite the Holy Cross College at College Road, Tejgaon. They can also be contacted at 911 4590, 0171 500 0798 or e-mailed at jagorani@dhaka.net. The last time we checked the Gulshan branch of the renowned brand, they did not have any Christmas-related stuff in store but a stop at the Dhanmondi branch got us what we were looking for. They may have restocked the Gulshan branch but if they have not you now know where to go. Jatra is known to be a store that works with materials that are very ethnic and speak of our culture, so why not the ornaments? Hexagonal baubles made of cane and napkin rings too. Wreaths made of paper, fabric bows with bells and tiny jute stars to hang on the tree. You will find a lot here to decorate your home for Christmas. You can nail these onto the ceiling where it is a little low and have your own stars in the house. These are long chains of stars strung together and made of paper to add a little difference to your hallway or corridor maybe. Also they have strings of fat fabric turtles which can be used the same way. A drop-in at Jatra will show you the best way you can use them around the house. Rickshaws and auto-rickshaws are two things that define the character of Dhaka city. These fabulous replicas of rickshaws and auto-rickshaws are spot on and make really good gifts that the receiver could flaunt in their living room or on a shelf in the bedroom. You can opt for the colorful ones or if you like things a little bit more rustic try the metal ones. If you have a love for the village you may want to check out the beautiful push-cart replicas they have. These are really unique in terms of showpieces. You can hide your treasured possession in these. Some are medium-sized boxes big enough to store jewellery with paintings of women in villages and village scenes whereas others are steel boxes big enough to place in a corner of the room as decoration, painted in yellow or blue and with magnificent images. If you are the sort of person who likes to wake up to colours then you would like the ones painted in bright colours with birds and cows and village women. If you are not then you would like the chic plain dark brown ones. Jatra has a huge collection of bed tables for breakfast in bed or if you are too lazy, for dinner on your bed while you flick through the TV channels. These toys remind you of the kinds that prevailed in the yesteryears, long before the soft teddies and Barbies took over. These wooden toys are something that would make children joyous. They have wooden mice in brown, grasshoppers in green, ants in yellow, black and red and many others . Jatra: Banani, 60 Kemal Ataturk Avenue & Dhanmandi, Road 27, House 39.